Earlier this year I had a small break between customer quilts, so I was able to work on something of my own! This was right after QuiltCon, and I was motivated to become better at quilting without my stitch regulator. I pulled out this quilt top, which included everything from straight lines to stitch in the ditch and curves! It was a great piece to practice on, and I think it turned out quite well. I quilted straight lines in the background areas, switching up the direction of the lines, the spacing, etc. In the curves pieces I used lots of different quilting designs. Some of the quilting is hard to see in the printed fabrics, so here are some pics of the back! This quilt finished at sort of an odd size (I think it's about 60" square). Perhaps I'll hang it in my studio with the backside facing out. There are so many great quilting designs on here that It will likely provide great inspiration! Quilting after PRK - my Halloween projects! A month ago I had PRK, which is similar to LASIK, but has a longer recovery period. I was told that my vision would be unpredictable, especially up close. It was weird to hear that, as I was having the procedure to correct nearsightedness, but it's because of the recovery process and the healing that my eyes are going through. Not being able to see well is not great news for a quilter, especially when the length of recovery can vary quite a bit from 1 person to another! I spent the first week doing a whole lot of nothing. I tried to quilt a few days after the procedure but just couldn't see clearly. Week 2 my vision was better but still very blurry. This is when I realized that I couldn't quilt, but I could piece just fine! I finally had the opportunity to sew some of my own projects! 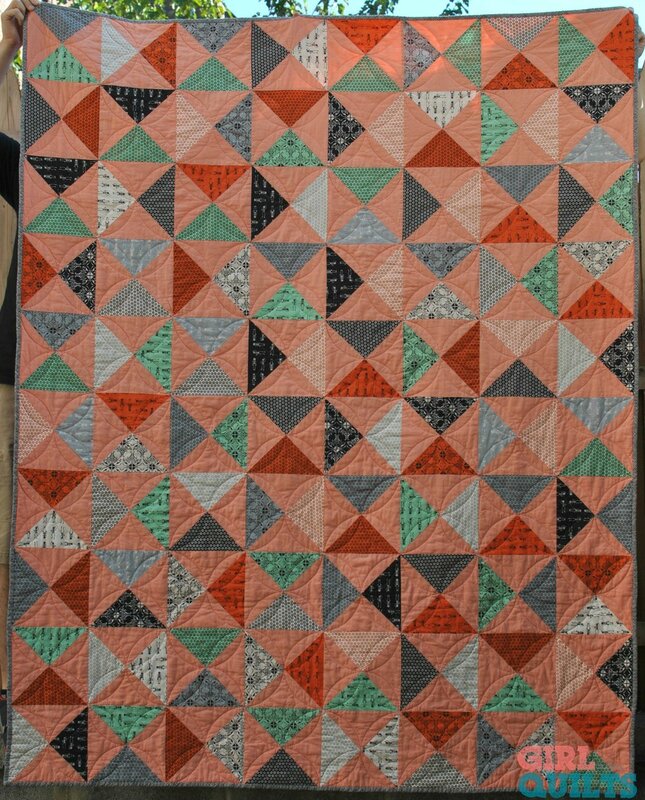 I started with a simple hourglass quilt made from a Halloween layer cake of Haunted Gala from Moda and a Cloud 9 solid in coral. I used the Quilter's Dream wool batt in this quilt, and I knew I wanted it quilted lightly. This was also a great way to ease back into quilting with so-so vision, because I used a ruler for the curves and I just had to hit the very obvious intersections of my piecing! I LOVE how this turned out. I spilled something on the quilt when I was carrying it around to hand bind while Addy was at swim team practice, so I had to wash it sooner than I otherwise would have. That ended up being a blessing in disguise, because the washing really softened up the batting! 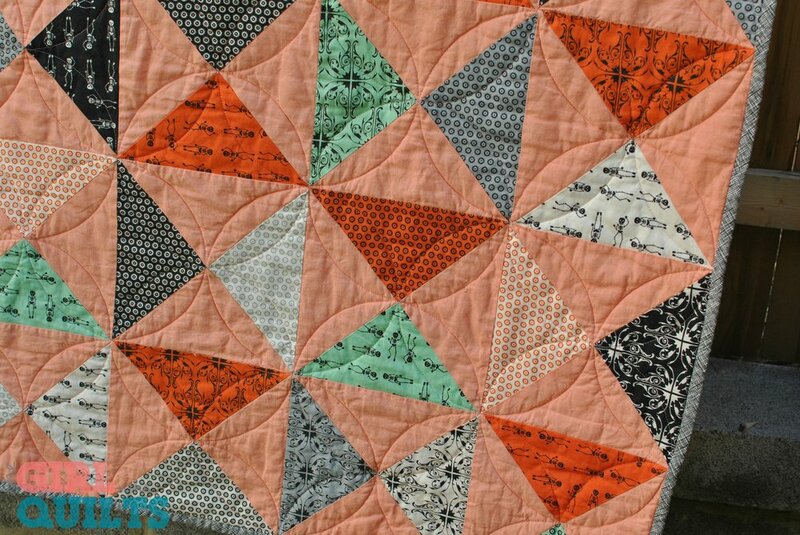 And that orange peel quilting -it steals my heart every time! For the backing I chose the Rhoda Ruth wide back Starlight print in flame. I'm in love with wide back fabric, and this sateen does not disappoint! For the binding I used the Carolyn Friedlander Architextures in black. I seem to love to collect Halloween fabric, and I had just bought a charm pack of Boo! by Cotton and Steel. I paired that with the leftover solid and made some quick pillows for our new couch! They ended up about 20" square, and I used the existing throw pillows that came with the couch as a guide. I played with some quilting that I learned from Jodi Robinson, and I really love it! It's a fun design to quilt, and it filled out these crazy-shaped areas quite well. I used another Cotton and Steel print called Paint Dot in Cloud on the back, and quilted it with randomly spaced straight lines. The fabric has these really fun metallic dots all over it. I'd love to get my hands on several more yards of that print, but it seems to be sold out everywhere! I used Quilter's Dream cotton batting in the select loft for the pillows. I really love the pillows and quilt on my couch, it adds a bit of color and whimsy to the room! I think that's what I like best about Halloween fabrics and decoration - it's a great excuse to embrace whimsical designs and just have fun! I'll try to snap a pic of the quilt and pillows in my living room and post it on Instragram. If you don't already follow me there, here's the link! 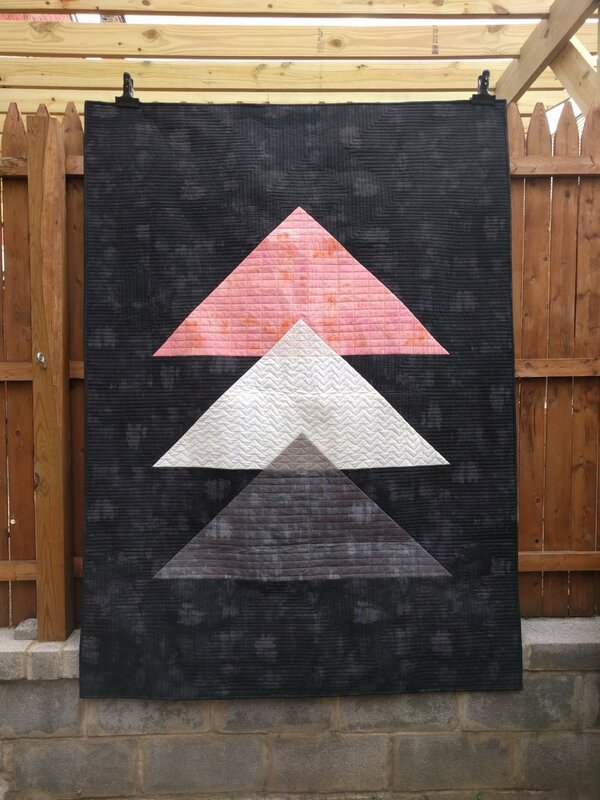 During the last Pittsburgh Modern Quilt Guild meeting, I had the opportunity to talk about how to make the most of your experience with a long arm quilter. As I was typing up some notes for the talk, I realized that I've never shared these tips with all of you! I want to do the best that I can with every quilt that enters my studio, but I can only control my own work. Here are some tips that help me to do my best work, which will result in both of us being happy! -Invest in quality fabric, thread and batting: long arm quilting is an investment. Make the most of your investment! Square up and press your backing - Rip your backing for straight edges! Do not baste the layers! -I prefer shipping without signature required. Please note that requiring a signature upon delivery may result in as many as 3 business days delay in my receipt of your quilt. Here is a printable version of these notes. This file can also be found on the Long Arm Quilting Services page. If you have any questions, comments, or suggestions of tips to add to this list, please leave me a comment! SewPro recap and a quilt! Wow, it's been a lot time since I've blogged! This past weekend I attended SewPro in Chicago, and I learned so much about running a crafty business. I'm the first to admit that one of my weaknesses is with social media. I loved InstaGram for a long time, and I still use it frequently. It's so easy to snap a picture while I'm working on a quilt and see the likes and comments pour in! Now that IG has changed, I'm struggling. I see pictures hours or days after they are posted, and I assume others are having the same experience! So, while I'll continue to use IG, I'm also going to recommit to blogging and sharing on facebook! Now, let's see how pretty quilt pictures! If you follow me on IG, you've seen these before. As usually happens, I snapped some pics as I was working. It's still quite fun, and oftentimes shocking, to see the full reveal! This is the Northern Lights quilt pattern by JayBird Quilts, and it was pieced by my mom! I quilted this with alternating swirls and straight lines. The straight lines really allow the swirly designs to stand out! In the center I quilted a swirling paisley, which has become a go-to design for me when I want to fill and elongated space. Here's a closer shot of the designs I used. Sorry about the pic quality! Stay tuned for some more long arm quilting. I have a huge backlog of stuff to share, and I'm hoping that my time at SewPro was the kick in the pants that I needed to jump back in!